I am looking forwards to joining the group build as I am a reader of RCM&E and I have read about the build before so am glad to finally join in albeit from Australia. 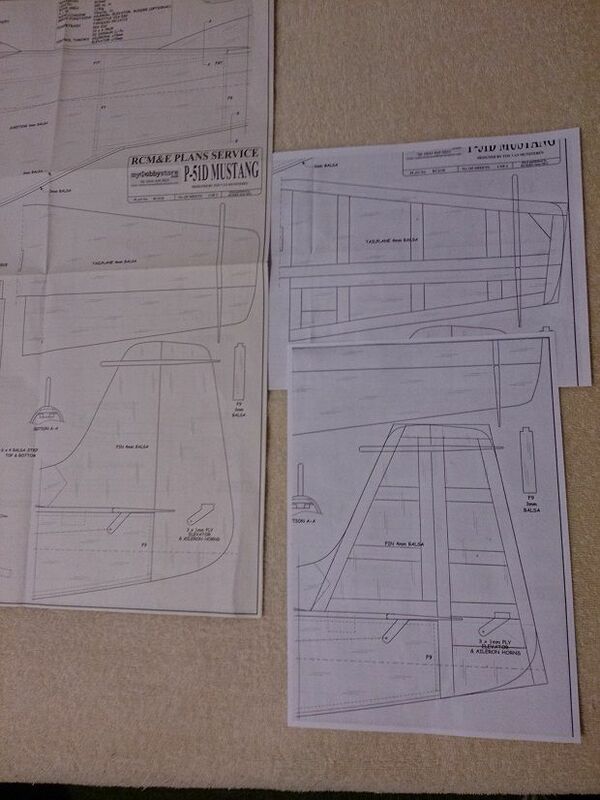 I have decided to build the Ton Van Munsteren P51B Mustang that was offered as a free plan in the mag. 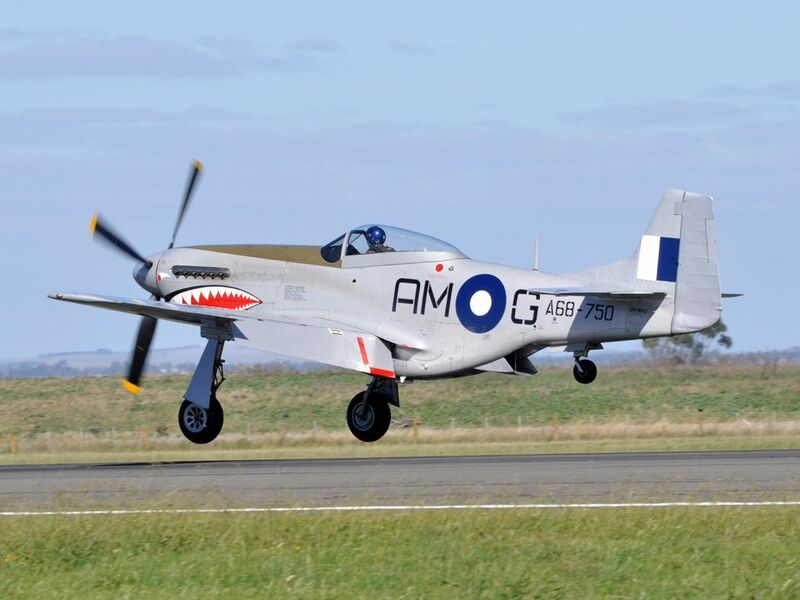 I have had several Mustang models in the past and all have flown well, therefore it was a no brainer although I must admit, there were several other models I was considering too, a scratchbuilt P40 KittyHawk was at the top of the list, maybe even a Zero! Apologies as this build still has not started but I am trying to finish of another before starting on this one. 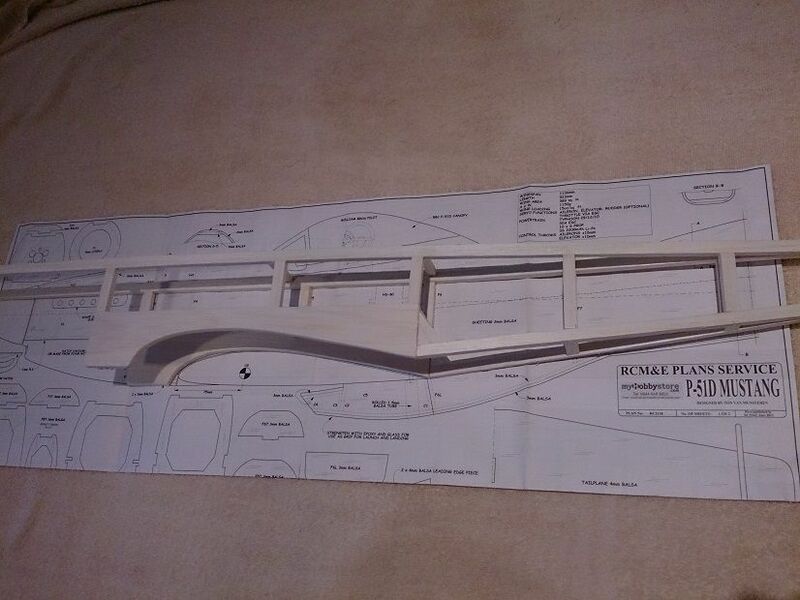 I've had a few thoughts on how I will be doing this Mustang build and although I will be following the plan, it will have some modifications to its construction. I will be only 'D' boxing the wing as I will be covering it with film only. 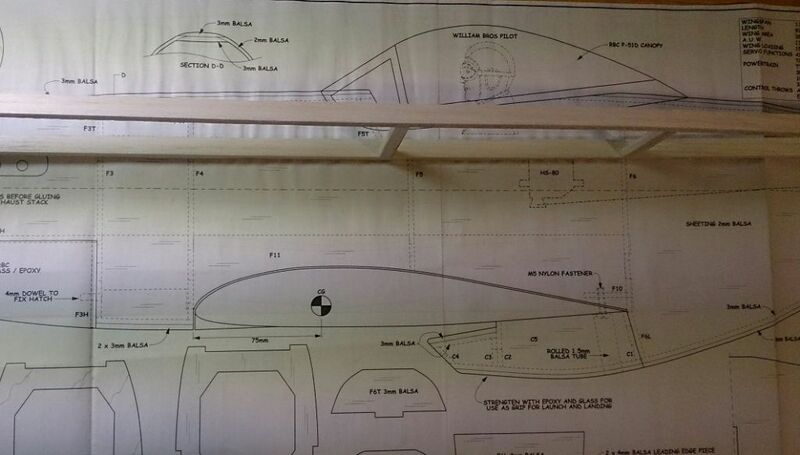 The tail surfaces will be of 'frame' stlye construction as opposed to full sheet. 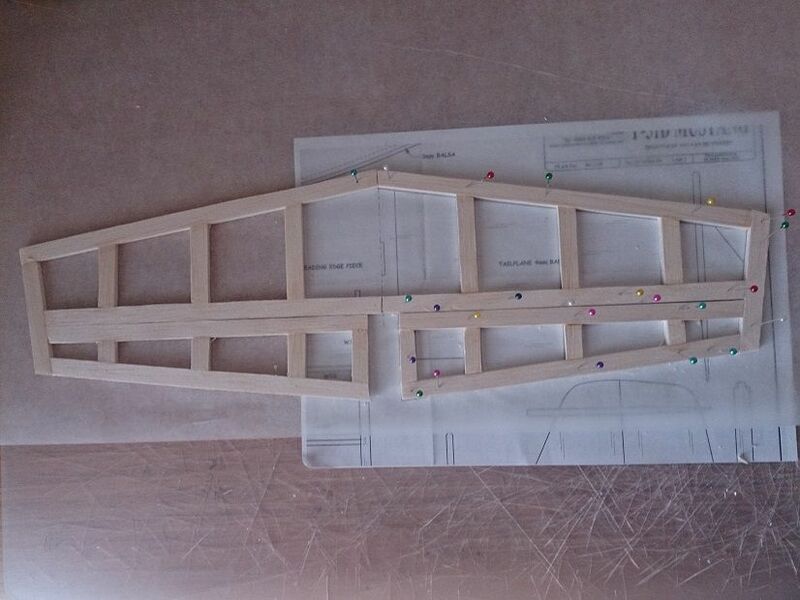 The Fuselage will also have more 'framework". Sorry there are no pics yet but they will come. Hi Rosco, looking forward to the build pics. Its not much but it's a start! As I mentioned before, I will be following Ton's plan loosely but adding my own touch to it. 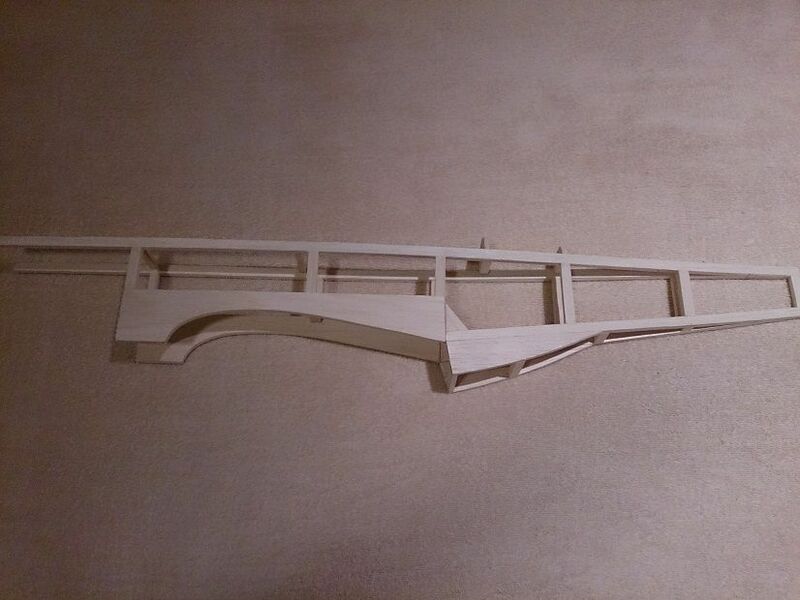 I have started by photocopying the tail and modifying it to be built as a frame rather than a single sheet as per the plan. At this stage it is a bit of an experiment but I can't see why it will not work. 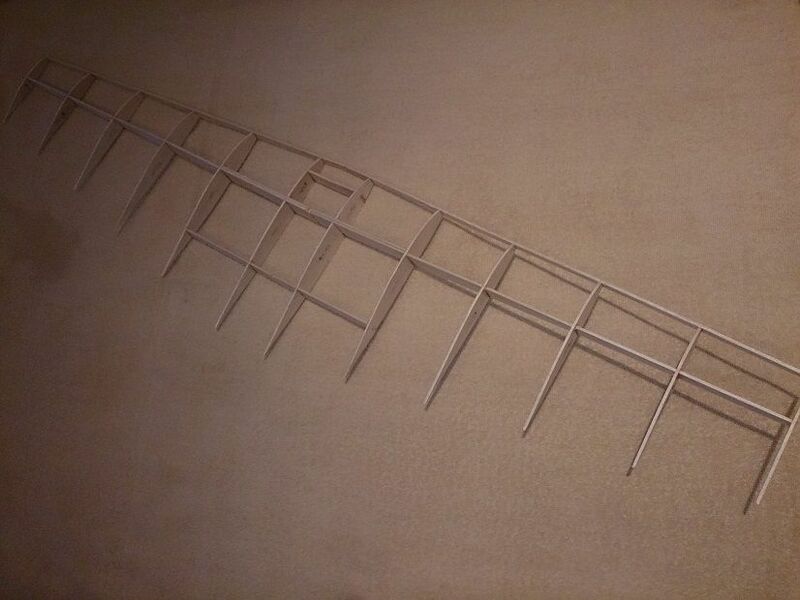 My plan is to make a majority of the framework from 5mmx10mm strips. 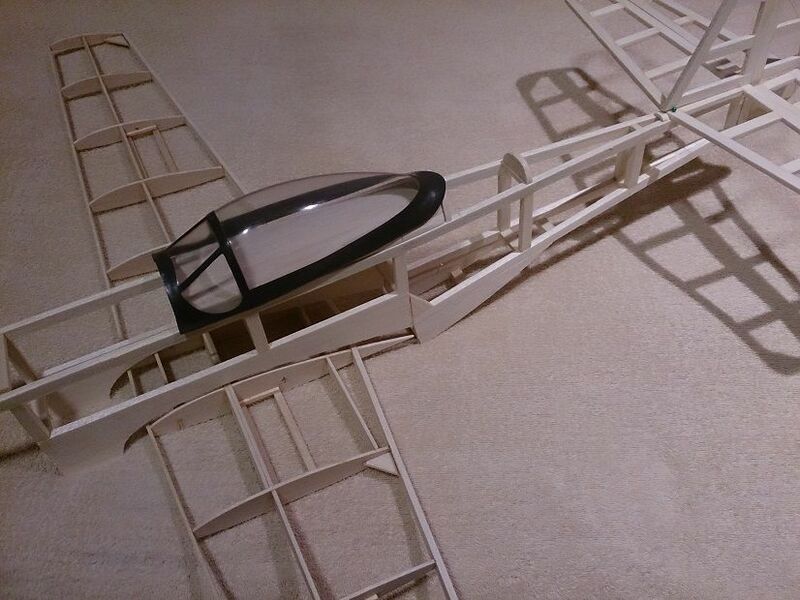 I'm hoping to build the fuselage in a similar manner, all in the name of trying to keep it lightweight as I don't plan on sheeting it. You can see where I have drawn a framework over the photocopy. This will be how I plan on building it. 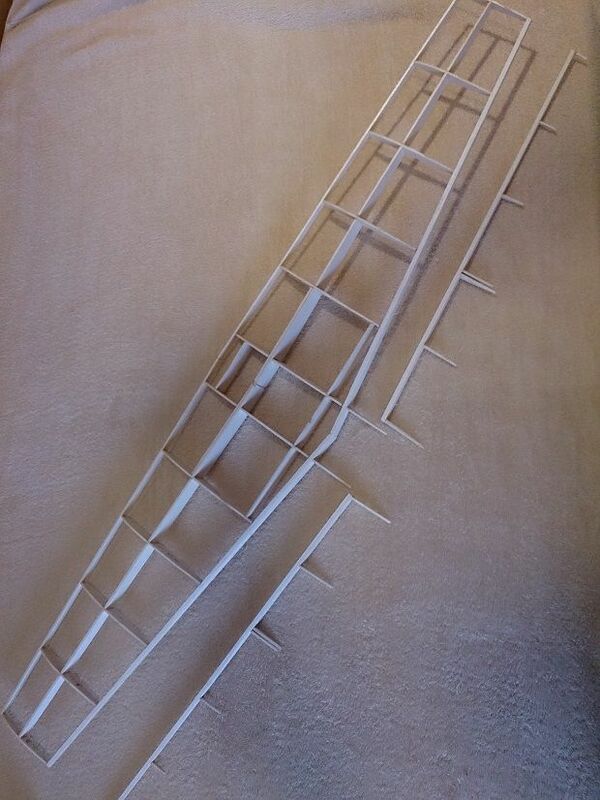 Today I got the tail surfaces built. 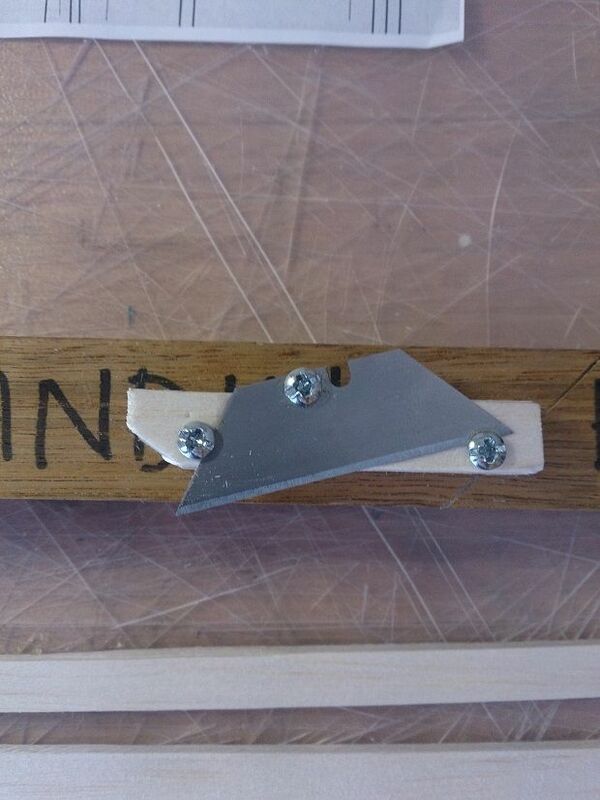 I had to make a crude balsa stripper but it did the trick! I got a start on the wing today. 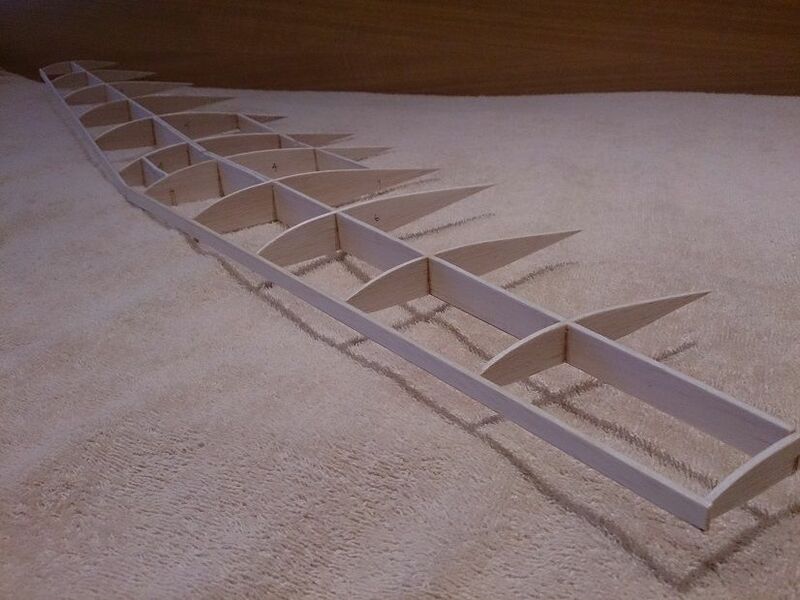 I have cut the ribs and spars but may add some strengthening because of my intention to cover it with film instead of balsa sheet. 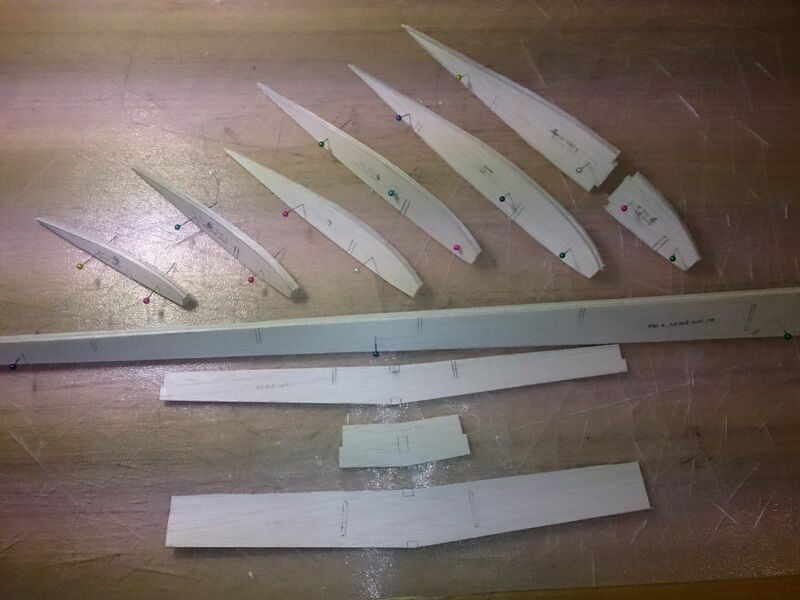 Whilst I have been cutting the parts I have been considering if I will have the ailerons as per the original plan or if I will run thinner full span ailerons along the TE? I have a Super Chipmunk that has the full span ailerons and it flies quite well. The other reason being that in an effort to keep it lightweight, I would like to use a single servo. We'll see......? Anyhow..... 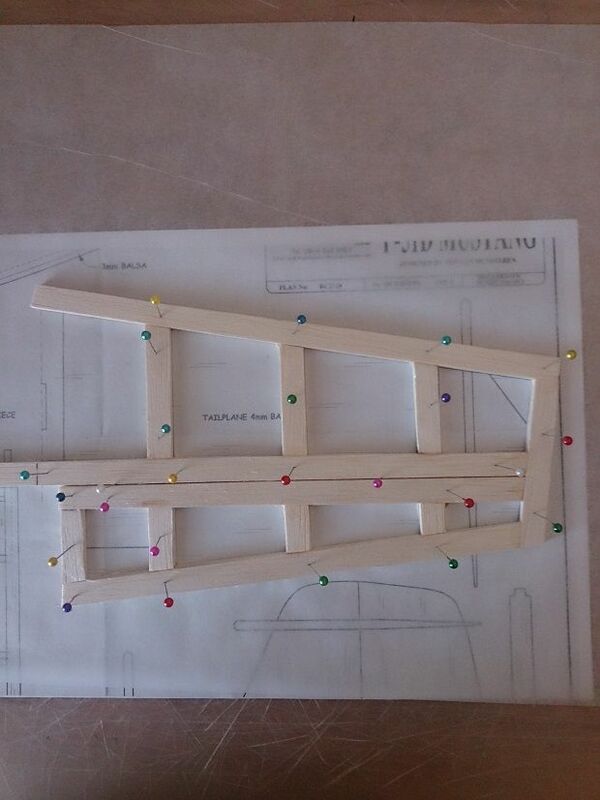 I also tried a different method of transferring parts from plan to balsa. 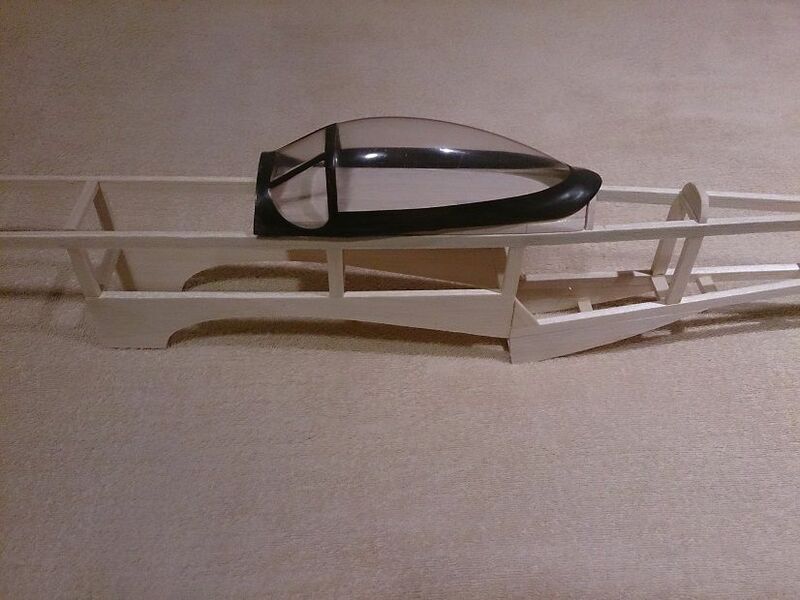 I tried using photocopied parts transferred by heat to the balsa. This method only works with ink from an inkjet printer but it did test my patience and melted my covering iron! 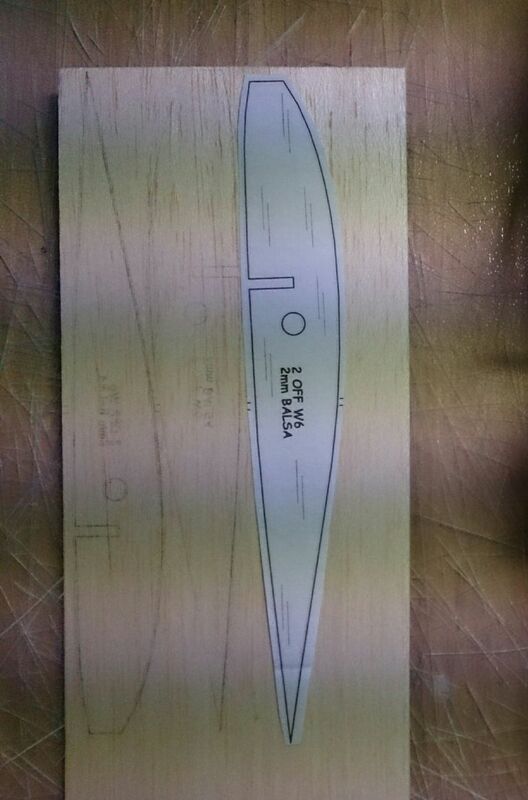 Basically the copied part is layed inkside down on the balsa and 'ironed' on. It works but I found it not to be as easy as it sounds. A photocopied cutout of a wing rib. Unfortunately because I need two, I needed two photocopies because after ironing it on once, the ink transferred across becomes almost non existent the more times it is used. The other issue is holding the paper in place. If it moves during the ironing, so does the line! I also found the balsa warping a little after applying the heat from the iron but I was surprised how well it actually transfers across if you get it right. The pic is of my first attempt but subsequent attempts got a better outline laid. 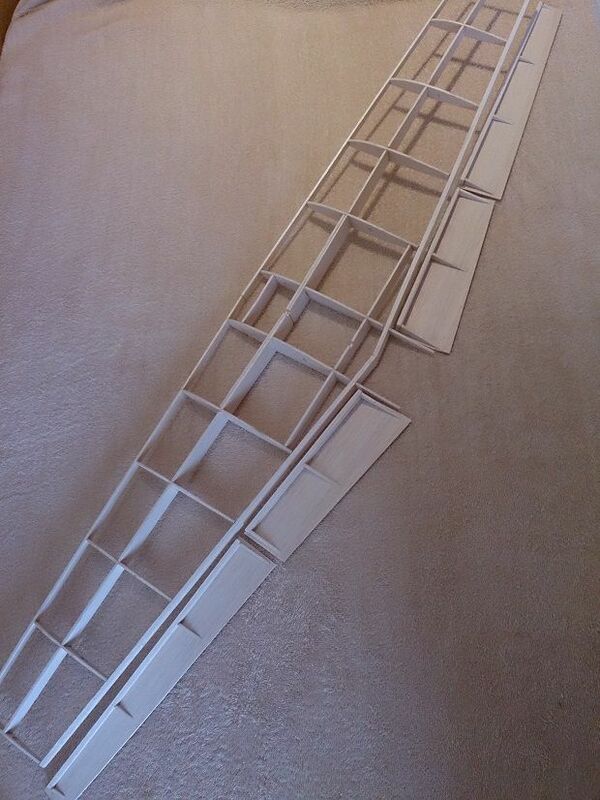 Today I started to put the wing together. I am still having some thoughts about how it will end up and what exactly I will be doing. Hopefully I can get a bit more done tomorrow............till then, here's some more pics. Next is to fit something for the servo's to fit into and finish the sheeting. 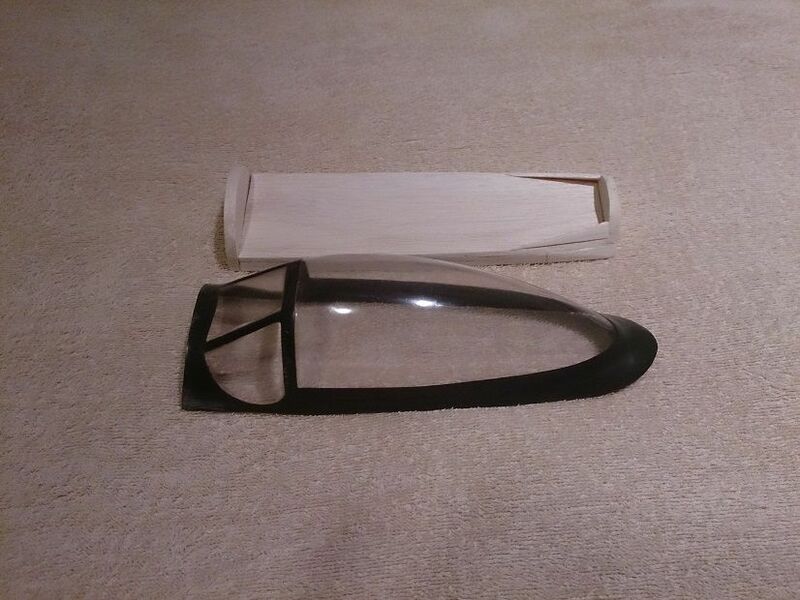 I will be using the covering film for hinges and need to sand the ailerons to suit. 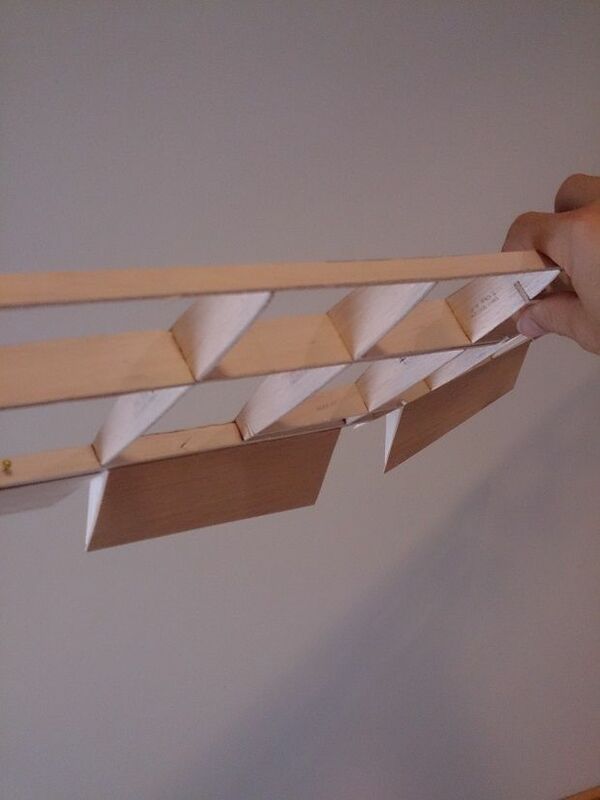 The flaps only need to hinge from the bottom so when they are up, there should be no gap. I need to make some tips up and add the strengthening gussets. Hopefully I'll get some time tomorrow, fingers crossed. Yes, I'm trying to keep the weight down and have been caught out in the past adding bits and pieces that proved unnecessary. 'Build it to fly, Not to crash' was something I heard somewhere and have run with it ever since. 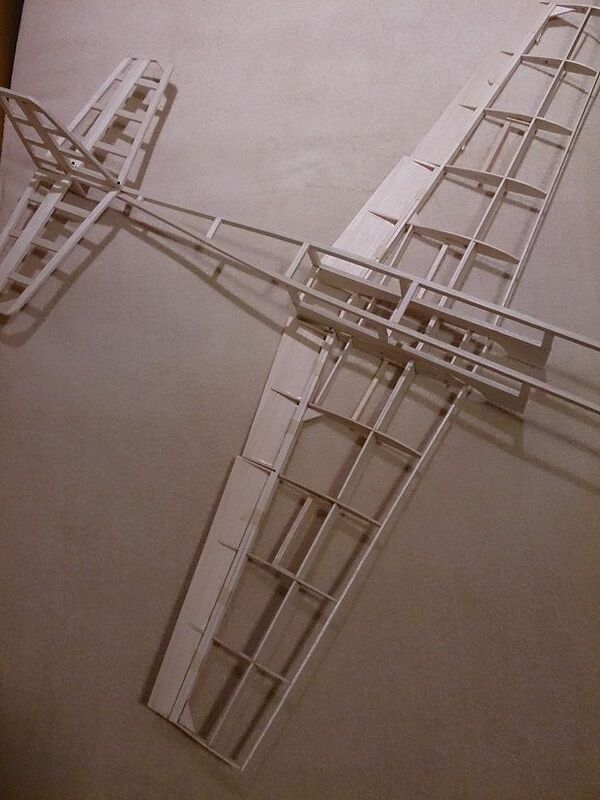 A bit off topic but I once built a balsa P51D Mustang, that I enlarged from the original plan. It was intended to be a free flight model but I just added some electrics to it for some enjoyment as an RC model. I built it exactly as per the plan and on its maiden, it actually flew - bar requiring some trimming, very well but unfortunately due to restricted space, I powered off and it crashed, with very little damage mind you. So.......back to building for a couple of hrs this morning. 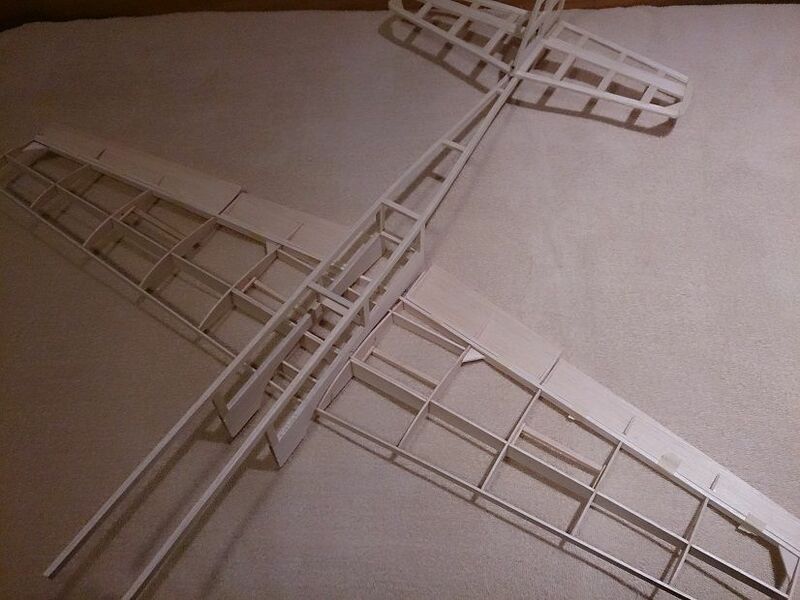 I've almost got the wing completed except for the sheeting and the tips. 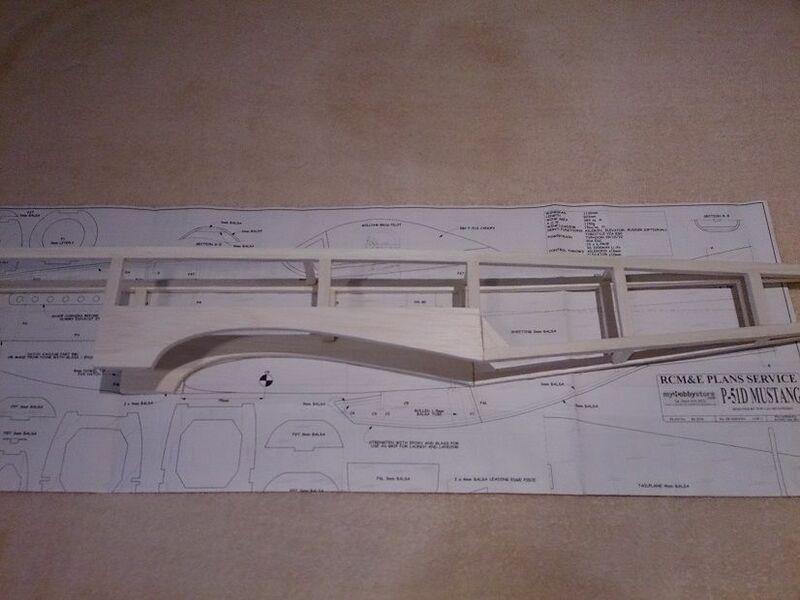 Seeing as though I can't get any more balsa today, I thought I'd consider my options about building the fuselage and sat down for a little thinking session! Ton's plan has the framework skinned but as you would know, I am intending on covering using film so mine will end up slightly different. 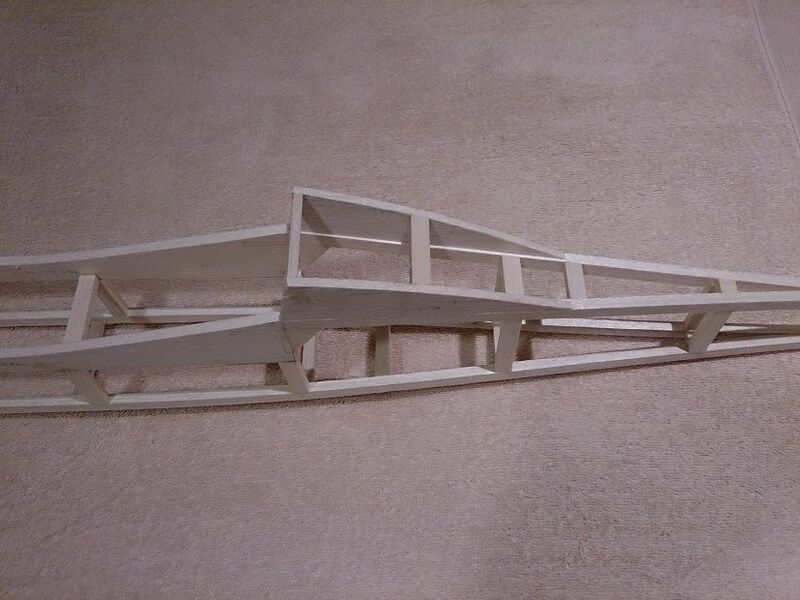 My intention is to keep it simple and just build a box style fuselage. 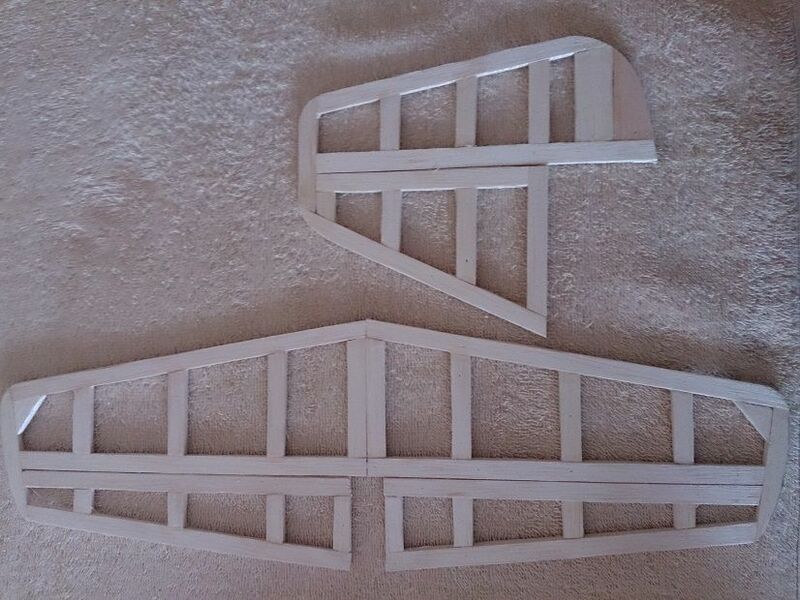 I will have some lightening holes cut out and have a former/bulkhead or three but I will be trying to keep it simple. The other difference is that it will lose some of its 'roundness' but I will still be attempting to keep a little shape to the fuze. It will still look like a Mustang when it's finished, that's the important part. 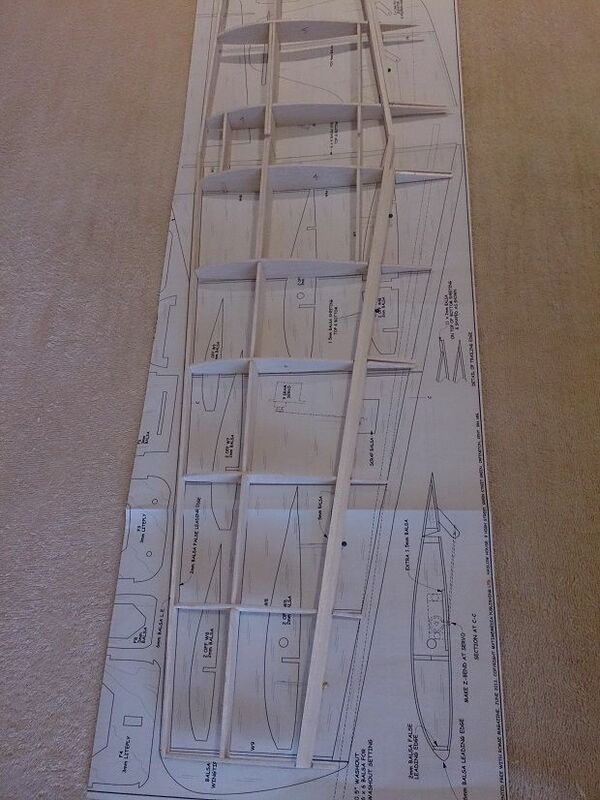 Now.....time to see when I can get some more balsa! The other difference will be that the original plan calls for a battery to be inserted under the nose where as I will be modifying the model to accept a battery from the top. 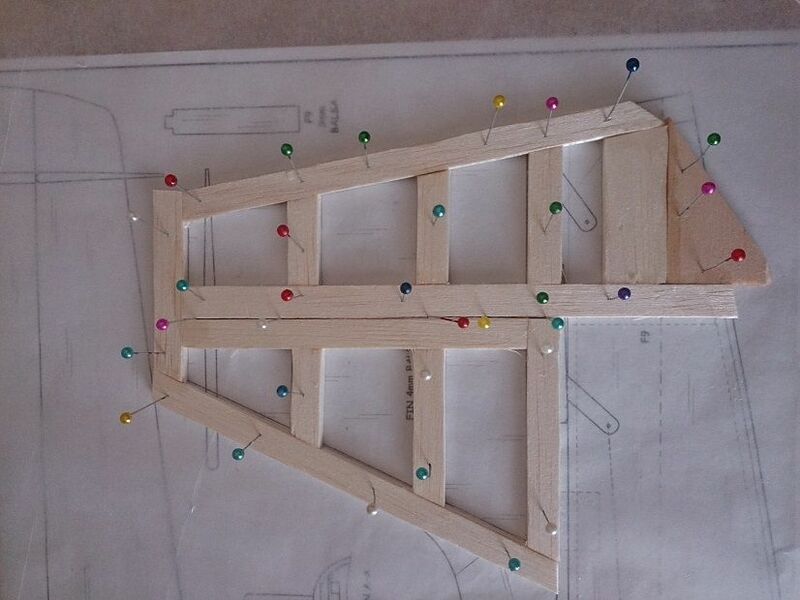 To add some strength to the frame, I am using 6.5mm thick balsa for the majority of the framework. Looks very light, and with flaps should fly nice & slow for landing. So...........today I've continued on the fuze, not much but it is slowly, slowly progressing . I started to 'fill in' the rear section of the fuze. I am still trying to keep it light and I'm still following Ton's plan. Once it is covered, it will hold itself together a little more also. My intention is to make the belly scoop from some sheet as opposed to building it up in 'frame' form. 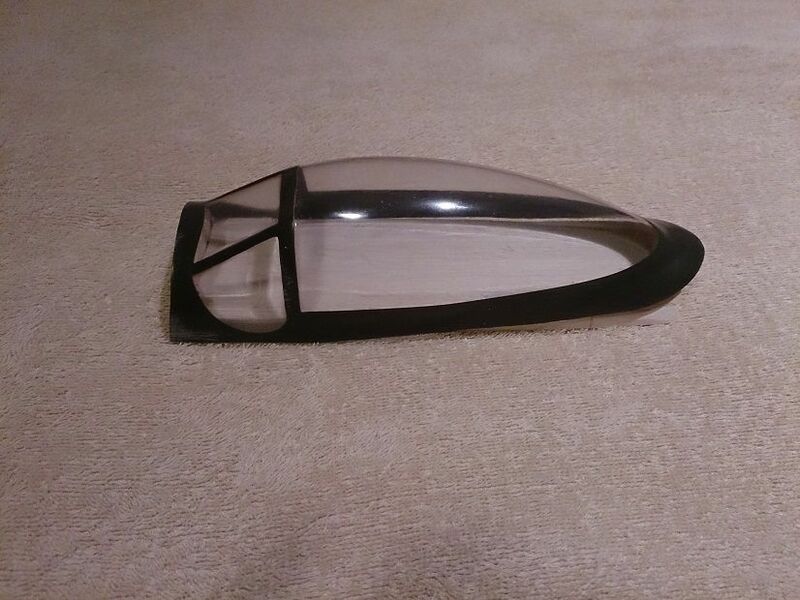 It will benefit from a little more strength in the belly scoop area as it will be a belly lander. That's it for now, maybe some more tomorrow? Fuze without the distraction of the plan! Great to see your modifications iam following your every step and its always good fun so see, that your going your own route. I spent some time creating a base for it so that I can fit it onto the frame and then have the turtle deck flow into it. 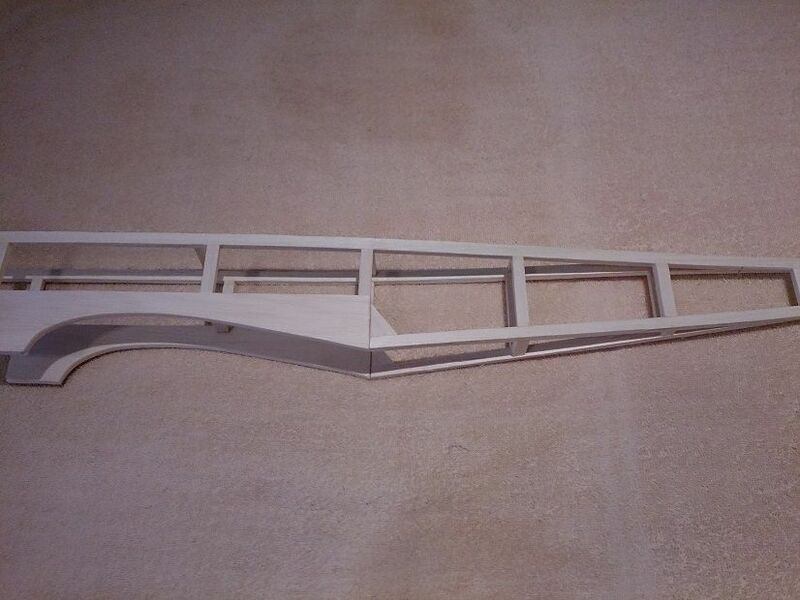 I have not really achieved alot more on the wing but this is because I have been thinking about how to mount it a little bit differently to Ton's plan. My thoughts were to have it mount via nylon bolts from the front and from within the fuze and locate at the rear via a locating pin/s or tounge and slot. I'm still thinking about that one.